Now I want to point out that Fantasy Flight Games introduced their new concept of a "Living Card Game" (LCG) lately, which should avoid buying lots and lots of boosters unnecessarily. With this new idea each month a fixed deck with 40 cards (called "Asylum Pack") will be released, which should improve the situation and nevertheless offer the chance to enhance the game steadily. Furthermore a new "Call of Cthulhu LCG Core Set" is available which comes with six awesome looking Cthulhu miniatures, a board for managing the story cards and lots of different cards from each faction - which is not only a great deal for new players in my opinion. One of the major appeals of the Living Card Game format is that it gives you not only a solid game experience, full of strategy and excitement, but it also allows you to customize your gaming experience to your liking. As you customize your deck from the Call of Cthulhu Living Card Game card pool, you get to build a strategy around your personal play style. Your options for deck-building are wide open and will continue to grow as we release more Asylum Packs, which will introduce new cards to the card pool every month. 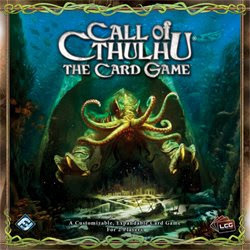 The Call of Cthulhu LCG Core Set includes 155 cards split between each of the seven factions. 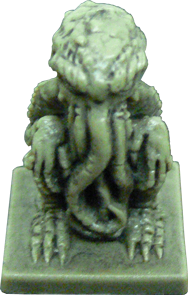 It also includes 6 plastic Cthulhu domain markers, 24 Cthulhu story markers, and a game board. It is the best way to start playing Call of Cthulhu LCG.